Welcome to the CardMaker and Ranger Industries Blog Hop! 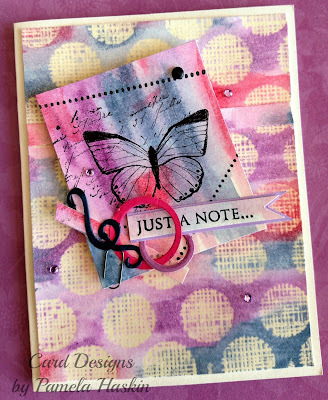 This week we, the members of the CardMaker Blog Team, have been playing with the new Tim Holtz water-reactive Distress Crayons. To be quite honest, I was really nervous about today's blog hop. I am more of a stamper than a painter-with-pigment kind of card maker. But, I surprised myself! I had so much fun with these Distress Crayons! To get the hang of working with these new crayons, I experimented on some scraps of cardstock first. After just a few tries, I found what worked best for me - work in small areas and smudge with a wet finger. I am really pleased with how my card turned out. To begin, I created a 4.25"x5.5" card base with heavy-duty cream cardstock. I heat-embossed a clear background onto another panel of heavy-duty cream cardstock. Then, I began coloring. I applied some of the crayon to my cardstock in a small area and with a wet finger smeared it out and over my background. With a wet paper towel, I gently wiped across the embossed areas to allow the embossing to show. I kept coloring little by little with different colors until my panel was all covered. I adhered it to my card with foam tape. I stamped over one of my practice-panels and trimmed it to use as the first piece of a freestyle-collage embellishment. I adhered the collage to my card with foam tape. I had so much fun learning to use these Distress Crayons! The colors are so vibrant. But, they can also be very soft depending upon how much water you use with them. It's all up to you. With a wet paintbrush, they also make an ombre look very easy to achieve. Thanks so much for hopping along with us today! Give these Tim Holtz Distress Crayons a try. I know I will be using my set often! Be sure and stop by my fellow Blog Team member's blogs and see all the inspiration they have to share with you today. Your next stop is at Carisa's blog. Below is a full list of participating blogs just in case you started here or get lost along the way. Your card is gorgeous! Love the bright colors. The contrast between the bold dot background and the wash from your collage piece is wonderful. Love the resist. So very pretty! I know what you mean about being nervous when you are out of your element... but you'd never know it looking at your card. I can't wait to play... you girls have inspired me to get in there and play ! Pretty card! Love the layering and colors! Oh! I love your experiment! Lovely! Sweet creation showing off those wonderful crayons. Sometimes going out of our comfort zone produces amazing results we never dreamed possible. Case in point your beautiful card! You aced this one! Love that background!! Nervous? Doesn't show!! Very cool card. You showed off the versatility of the crayons beautifully. Very creative amd cool looking card! Love it!